Last year was the year. I was on top of the world. Top of my running game. I felt like I was moving forward in my career. Financially we had been making huge strides, and yet, emotionally I was dead on the inside. The outside looked beautiful. I felt completely on top because I was. Achieving was easy on the outside but dead on the inside. My how the table has turned and grass isn't greener on the other side or maybe it is? I broke up with my career, shifted gears and could not feel my humanity more than ever. When you go from being on the top to being on the bottom, the world changes. Financially everything has changed, emotionally am more alive, but I can't access those feelings of worthiness. Why do we equate success to money? Why is failure associated with high careers, money, and value? It's completely messed up! Brazen is teaching me to find the courage within who I am, the things I love and that I am ENOUGH. I wish this book would have come out sooner in life, but alas, it came right when I needed it. And you have a chance to win a copy! Come be you are WITHOUT shame! Don't be a carbon copy of someone else, but be only YOU! Every day, there will be a different giveaway. Somedays, it will be a mystery giveaway where I won't list the item. Other days you will get to see what the item is that I'm giving away for that day. The items range from books, cookbooks, gift cards, DVDs and mystery surprises..
Random.org will choose a number every night. I will contact the winner via email and if I don't hear from you, your prize will go into the final drawing on the last day. All uncollected prizes will be given away to one random winner. I will send the winning prizes out at the end of each week! 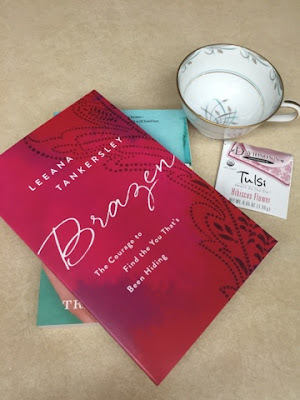 Today's giveaways is a copy of Brazen by Leeana Tankersley. Comment below for your chance to win! Happy Thursday!!! Come back again tomorrow! Thanks for celebrating my Birthday bash! Happy Birthday celebration! Yes, I understand having to walk a path or be someone different than who you were. However, as long as we walk with God, we will be ok. Thanks! Oh Sarah, your post hit me on so many levels. I've been there...the self-doubt, the confusion, the financial worries, etc. I get it. All of it. Last week after I walked into a gym for an interview and felt the beefy trainers judging me, I just cried in my car after I left. I questioned what the heck I was doing, whether I would ever belong in this new career space and if I could hack it. Kinda silly since I have just barely begun. But it's hard. Definitely the road less traveled. You should be SO proud that you took a leap for happiness, joy and self-worth. Proud of you! <3 PS I know I already won so don't enter me...I just felt compelled to comment. The quote you start the post with is everything I needed today. Thank you for sharing a piece of your story, brave lady. You can always win a second and third.. Random.org chooses the entries not me. Please, I have a whole month and lots of fun stuff, so you better keep commenting :) Thank you for your transparency. It feels good to know I'm not alone. I'm sorry about your experience. I'm going through similar ones myself. It's hard to put yourself out there. Hugs! It will get better for both of us!! Thank you, Alison! I hope whatever journey you find yourself on, this is an encouragement to you! Thank you for coming back!